I’ve been dreaming of my various characters. I’ve made up whole scenes and chapters during drives to and from places. I’ve even sat at my computer pumped to do some critting/writing/editing/other related writerly things and then passed out because I’ve been so exhausted. But, nothing much has actually come of it. I do have moments during the day that I worry I’m ruining everything for myself and then I have moments that I explain to myself how busy I am and that things will smooth out and start working just fine really soon. But then I go back to doubting anything will ever go back to being right and wondering if I’m really a writer. Of course, if I wasn’t a writer I don’t think I’d have the tons of ideas, dreams, and desires related to the writerly world. So, I’ll go with a little insecure, a little secure, and a whole bunch of I’m determined to have something more to say next month. Make sure you hop over to the wonderful Alex J Cavanaugh. Check out this month’s hosts too- Laura (My Baffling Brain), Mark Koopmans, Shah Wharton, and Sheena-Kay Graham. 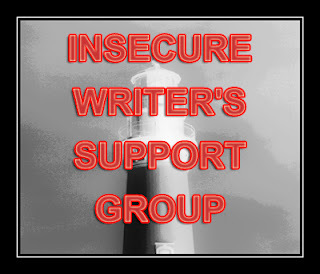 And don’t forget about the IWSG Website. Maybe you need one of those voice recorders so you can talk about the scene when you're planning it. Then when you're at the computer, play it back - your excitement should come through and get you on the keyboard. Just don't pass out until you hit the save button. An overly active mind can be somewhat of a burden, but would a writer want anything other than a head filled with ideas? I always told myself, "If I wasn't meant to be a written then I could have these characters and stories in my head." And it's true. You are a writer, Kela! Life is tough enough when you're not trying to write a book! Give yourself a break, goals, and do what is most important first. :) I also like Alex's suggestion about a voice recorder. That could help a lot! Oooh I have done that where I scheduled a post and then it didn't actually post! I know exactly how you feel. I think about all these things and then i worry that I might forget them before I get a chance to write them down! You are a writer and you write beautifully. I loved your description of being secure and insecure at the same time. You sound like a writer to me. We're all a little up and down at different times. "A little insecure, a little secure, and a whole bunch of determined to have something more to say next month." Yep, sounds about right. Just keep working on your ideas. You never know exactly what will go where. You're definitely a writer. We're all a little secure at times and wonder what on earth we're doing. :)You'll make it. I'm dreaming up characters and scenes while I bike or jog for my next novel. I'm hoping to organize a true outline this time. Some of the most creative things happen for me as a writer when I'm away from my desk. Those free reign thoughts are as much a part of writing as typing them down.